Codorníu is a large producer of Cava, Spanish Sparkling wine, making 6 million bottles a year. They are located in Sant Sadurní d'Anoia in Catalonia where competitor Freixenet is also located. Their cellars located there are designed by famous Catalán architect Josep Puig i Cadafalchwere, and were declared "a National Monument of Historical and Artistic Interest" by King Juan Carlos I. The Codorníu cellars are open for visits (advance reservations suggested) and you can arrange tastings including a special beginners tasting and more. Codorníu is amazingly the world's largest producer of sparkling wine made by the traditional champagne method or méthode traditionelle. The Codorníu family has been in the wine business since 1551, and in 1659, Anna Codorníu married Miquel Raventós uniting the Codorníu family with the Raventós family, which also had a long wine making tradition. 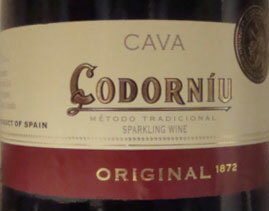 Supposedly Cava was first produced in 1872 when Josep Raventós made sparkling wine using native grapes and the “Traditional Method” for making Champagne. They cultivate their own vineyards which are in three different areas. In the Penedès region they grow the traditional grape varieties of Macabeo, Xarel-lo and Parellada. In the Conca de Barbera region they grow their Pinot Noir. In the Costers del Segre region they grow both Pinot Noir and Chardonnay. Each plot of vines is harvested and vinified separately, and they practice sustainable agriculture, including organic pest control, cover crops between rows in the vineyard, and only intervening in nature where necessary. Codorníu Clásico - The entry level traditional wine made from Macabeo, Xarel-lo and Parellada. Codorníu Clásico Rosé - a traditional Cava Rose made from Monastrell, Garnacha and Trepat grapes. Codorníu 1551 - A Brut and Brut Nature (no added sugar) made from the traditional grapes and ideal as an apertif. Named after the year of the "Codorníu Saga" began. Ecològica de Codorníu - Made from organically grown grapes. 64% Xarel-lo, 32% Parellada and 4% Macabeo. Mediterrania de Codorníu - Made from 64% Xarel-lo, 32% Parellada and 4% Macabeo. grown near the Mediterranean in the Penedès. Anna de Codorníu - Their top of the line wines, including a Brut (70% Chardonnay along with traditional grapes, Blanc de Noirs (100% Pinot Noir), and a Rosé (70% Pinot Noir, 30% Chardonnay). Selección Raventós Rosé - A rose made from 85% Pinot Noir and the rest traditional grapes of Macabeo, Xarel-lo and Parellada. For early drinking. Grand Codorníu Riserva Chardonnay - Fermented party in oak and aged a minimum of 15 months. Tasting Note: Codorníu Original - February 2013, rated B/B- a very pleasant wine. The nose has a little citrus including a very light touch of grapefruit. On the palate there is orange citrus and citrus. It's juicy, medium dry and nice. Certainly a good deal in sparkling wines. I believe this is the same wine as the Codorníu Clasico, and it is made of the traditional grapes Macabeo, Xarel-lo and Parellada.